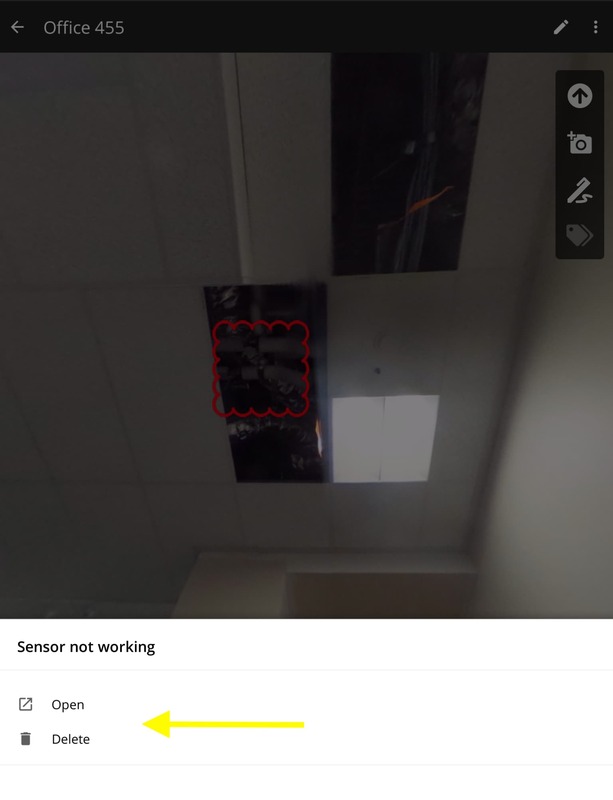 The JobWalk App supports the creation of and editing capabilities for 360 Markups. Learn how to work with 360 Markups on your mobile device. HoloBuilder 360 Markups are annotations you can add to your 360° photographs. They can be used to visually highlight specific details or areas within a scene and can have a title as well as a descriptive text. 360 Markups can be be a very helpful tool when informing stakeholders about details within a project, and can also be used for advanced collaboration. You can also learn more about how to work with 360 Markups in the Web Editor. You can add 360 Markups in any 360° photo in your HoloBuilder project. To do so, open a sheet, select a location with a 360° photo and open it. On devices with a small screen (such as an iPhone) you then have to click 'Open' in the lower left corner. Once the photo is opened, click on the small pen icon in the right-hand sidebar as pictured below. A dialog will open where you have to add the Markup title. You can also add additional information in the larger text field. Once the 360 Markup has been created, you can drag and drop it to the desired location simply by touching the screen. Please note that only one type of 360 Markup is supported at the moment. To make more advanced edits, please use 360 Markups in the Web Editor. 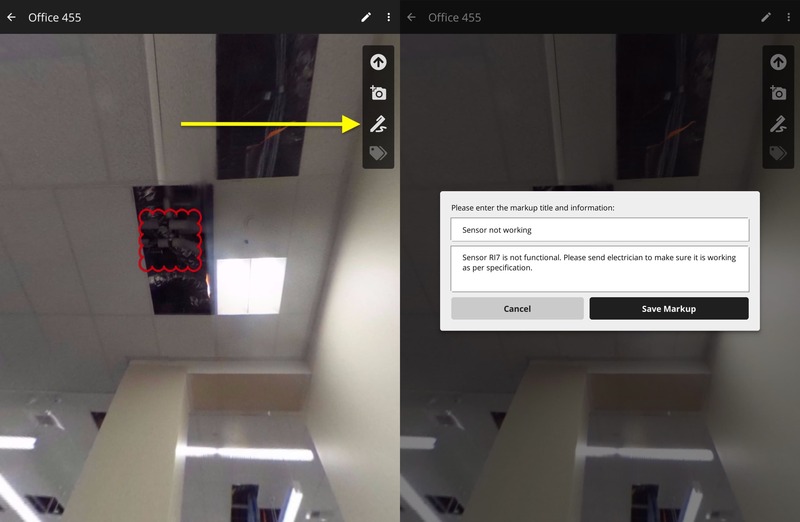 To edit or delete a 360 Markup simply tap on the 360 Markup. A menu will then open at the bottom of the screen where you can either delete the 360 Markup or select 'Open' to reach the dialog where you can change the 360 Markup title and description. For more advanced editing capabilities you can work with 360 Markups in the Web Editor. 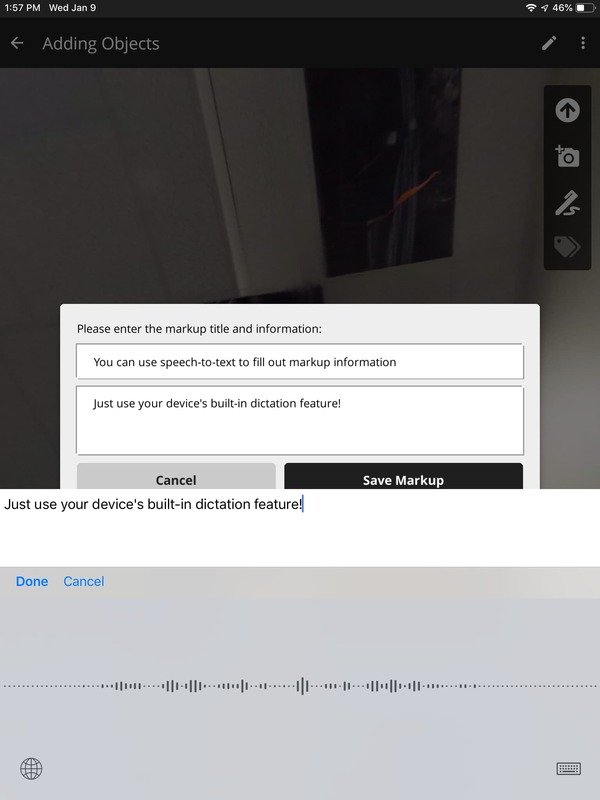 When creating or editing markups you can often save time by using the dictation feature of your phone. All recent iPhones and iPads and most other mobile devices support this feature, refer to the user manual of your device when in doubt. If you are using an iPhone, read more about how to use the dictation feature in the Apple knowledge base.